The high-priced end of the Greater Boston single-family market is represented by towns like Weston, Wellesley, and Dover. There may be higher-priced housing in Brookline, but not as much of Brookline is single-family, and the picture there is clouded by condominiums, small rental properties, and extensive conversions and upgrades undertaken in the past two decades. The Warren Group measures single-families as a separate category. For a simple single-family price trend measure, the market outside Route 128 is best. The price trend for Weston single-family houses is shown in the graph that follows. 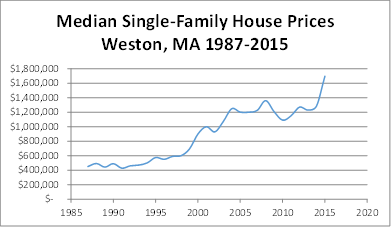 The trend displays the Weston median single-family house price from 1987 to 2015. The median is the middle price in a group. If 101 houses sold in a year, it is the price in the middle, with 50 houses priced higher and 50 lower. The median is not a "pure" measure: houses changed from 1987 to 2015. New houses grew larger. All houses aged. But the median remains a good measure for Weston. In any year, the median house was not a brand new house. In 1991, the house at 32 Orchard Avenue in Weston sold at about the 1991 median price. It was a 19-year-old Cape with 3,355 square feet of living space and five bedrooms on a site of 60,436 square feet. In 2011, the house at 36 Robin Road sold at about the 2011 median price. It was a 53-year-old Cape with 3,182 square feet of living space and four bedrooms on a site of 83,087 square feet. The median house may have changed somewhat, but not enough to skew the results substantially. The median appears in this case to be a good yardstick for price change at the top. One trend that may have suppressed prices in Weston since about 2000 is the trend to urban living. In 1990, the high-end Weston house was the best residence in the Greater Boston market. By 2010, much of the high-end demand had shifted to the Back Bay and Beacon Hill. A study of price trends for townhouses and condominiums in Boston would show prices trending up much more steeply. The highest-priced residence in Boston in 1990 was the townhouse at 22 Louisburg Square on Beacon Hill, a 6,003-square-foot building that sold for $2,900,000. In 2015, it was a condominium at Heritage on the Garden (300 Boylston Street), a 5,083-square-foot unit that sold for $15,400,000. No houses in Weston sold in 2015 for more than $9,000,000. The graph presented previously was not time-adjusted. Prices for Weston houses went up from 1987 to 2015, but so did the prices for pretty much everything else. The increase may be attributable to nothing more than inflation. To answer whether that is so, we need to look at the data in time-adjusted, inflation-free dollars. 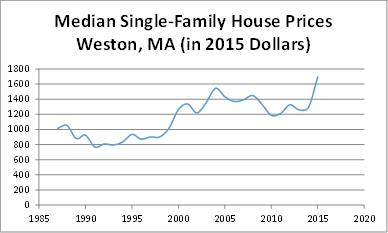 The graph that follows shows the Weston median single-family price, time-adjusted to 2015 dollars. It takes inflation out of the equation. The graph shows Weston's time-adjusted median single-family price declining from a late 1980s peak, then rising to produce real (and not simply inflation-derived) growth in value since 1999. Weston's single-family market showed strong growth for the past two decades, in spite of the shift in demand for high-end housing from the suburbs to the city.